The Nike Tiempo legend V is back with a brand new and fresh colourway. This time around we are talking about a red and white paint job for the classic boot from Nike. 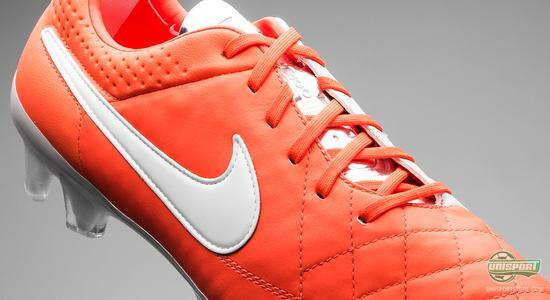 Just as it is the case for the other three Nike silos, the Tiempo Legend V is also coming n a new colourway today. 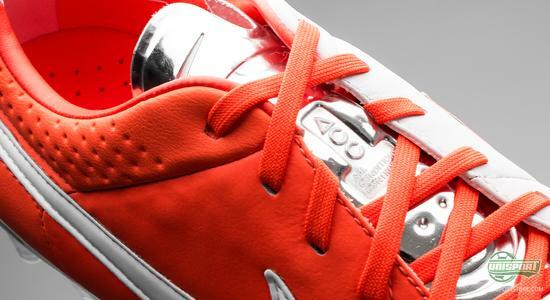 A fresh and sharp red colour complemented by a white colour on the medial side is the colours Nike have chosen for this one. 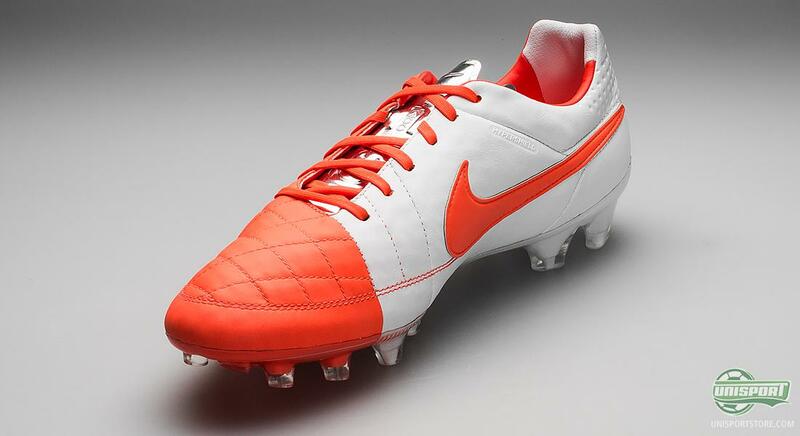 A super sharp combination, which is sure to be well received among the big crowd of Tiempo Legend fans. One of the most popular versions of the Nike Tiempo Legend IV was the red colour, which we saw a lot on the feet of Sergio Ramos, among others. 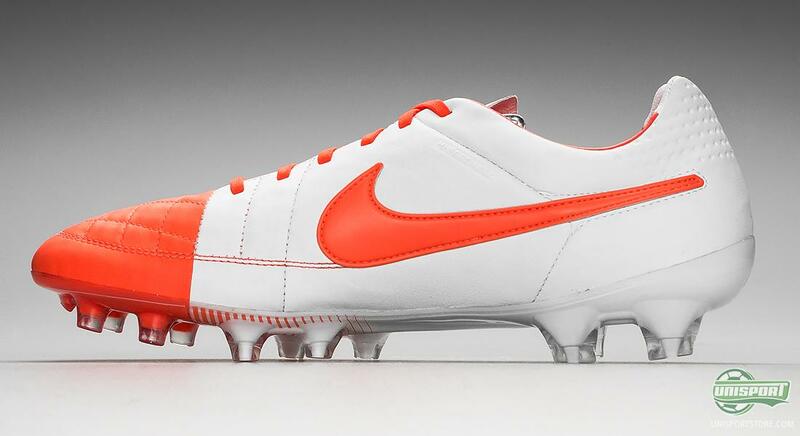 It is therefore no surprise that Nike have chosen to go with a red and white design for the fifth generation of the Nike Tiempo Legend football boot. With the latest generation of the Nike Tiempo Legend series, the Americans have done their very best to create a modern boot that has what it takes to make it in the long run. Nike have spent two and a half years in creating this football boot, and they have worked hard on uniting a fantastic touch on the ball with a consistent weight. 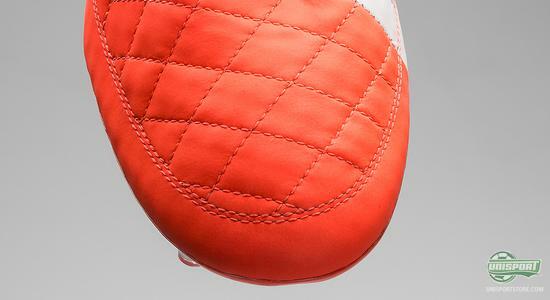 Leather boots are known to become heavy as they get wet, but Nike have worked on avoiding this with the new Nike Tiempo Legend V.
The upper on the Nike Tiempo Legend V consists of an incredibly soft and supple piece of kangaroo leather. The result is an outstanding ball feel and a just as amazing fit. The rear part of the heel is made of Nike's leather emulating KangaLite material to further improve the stability and durability. 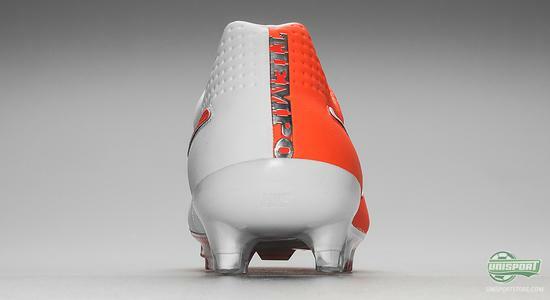 Moreover, the boot is also equipped with Nike's ACC technology, which ensures sublime control in all weather conditions. And when it's raining cats and dogs, it is highly important that your boots do not take up all the water, and become heavy. 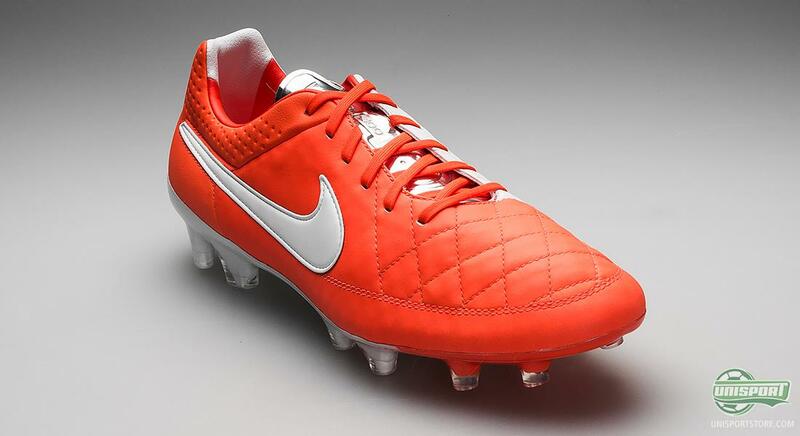 Therefore, Nike have added their advanced Hypershield technology to the Nike Tiempo Legend V. Hypershield is developed to reject water, to ensures that the leather does not take up water; and with this addition Nike have managed to create a leather boot with the advantages that are normally just known from synthetic boots. 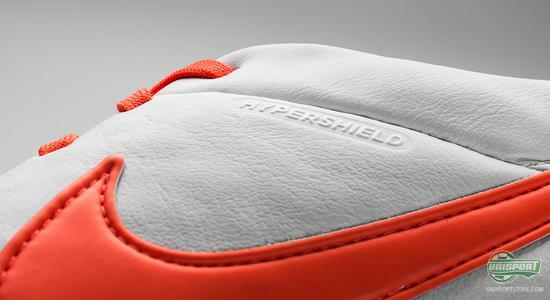 This revolutionising Hypershield upper manages to substantially lower the water uptake of the boot. 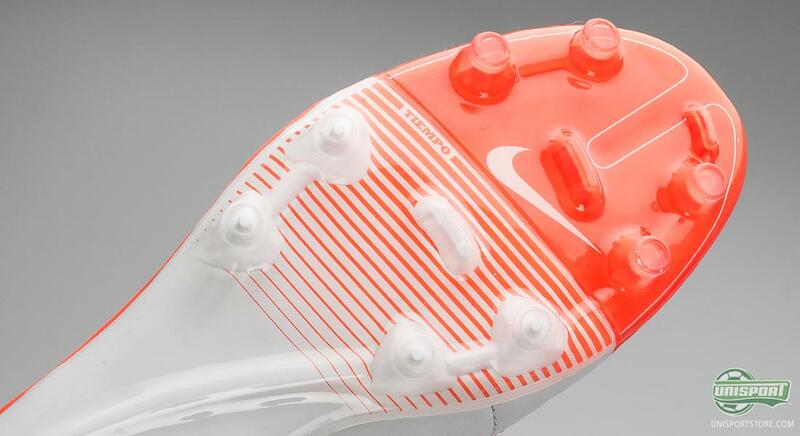 The fifth generation of the Nike Tiempo Legend absorbs 73% less water, when compared to the Nike Tiempo Legend IV, the material dries 24% faster, and the upper is even 88% stronger than that of the Tiempo Legend IV based on Nike's own tests. In other words, a remarkable technological improvement, that indicates a big step ahead for the Tiempo collection. The sole is made of TPU, and is developed to be both flexible and moveable. Nike have been inspired by their Nike Free collection, where the shoe follows the natural movements of your foot; the argument being that, if a running shoe can follow your body, then why not a football boot? 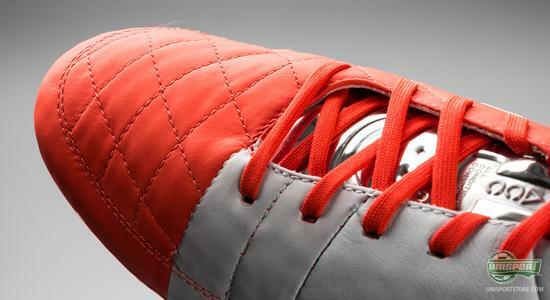 The Nike Tiempo Legend V takes comfort and fit to a new level with a flexible sole around the forefoot. Regarding the stud configuration, Nike have chosen to go with a combination of rounded studs in front and bladed studs to the back. The rounded studs facilitate better rotation and distribution of pressure, while the bladed studs to the back ensure a good stability. Furthermore, the studs have, in general, become a bit wider, which also adds to the overall grip to the pitch. With the new Nike Tiempo Legend V, Nike have managed to write a big and important chapter in the legendary story of a football boot. The boot weighs in at just 245 grams, which is in the very low end of the scale for leather boots for top shelf comfort. Here at the Unisport Headquarters, we very much applaud this new red and white colourway of the Nike Tiempo Legend V football boot. There is also a good chance that we will already see the new colourway on the feet of some of the biggest Tiempo stars, as soon as this weekend. A beautiful and fresh colourway for the Tiempo football boot. What are your thoughts on this colourway? And what is your opinion on the Tiempo Legend in general? Take you football passion to a social level and let us know your thoughts on Facebook and Twitter.